Any chance I get to hang out with my babe I’m on board. Dating is a key component to our marriage. We love eating out, catching a new movie and spending time together. This weekend we were in Glen Allen Virginia. We knew before going up there, we were going to have two date nights and I was looking forward to them. I love getting dressed up for my babe. Today’s outfit was purchased just hours before taking this picture. I don’t usually buy clothes and wear them the same day, but I thought I didn’t pack enough clothes so babe took me shopping. I later fond my missing outfit in my luggage under my laptop. Oops! I’m so glad I had the wardrobe snafu though because then I wouldn’t have added this cute ensemble to my wardrobe. Coral is my new favorite color. This top just does something for my complexion. I have a chocolate brown top that plays nicely with the color of this shirt. The fact that it has a faux chain around the color drew me in. 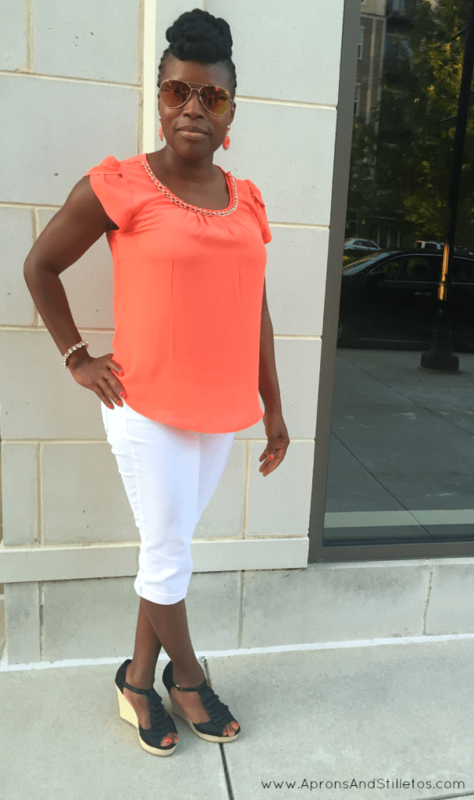 I’m an accessories girl and love a great statement necklace with my outfit. With this shirt, that’s already taken care of. Now, the white capris just do it for me. 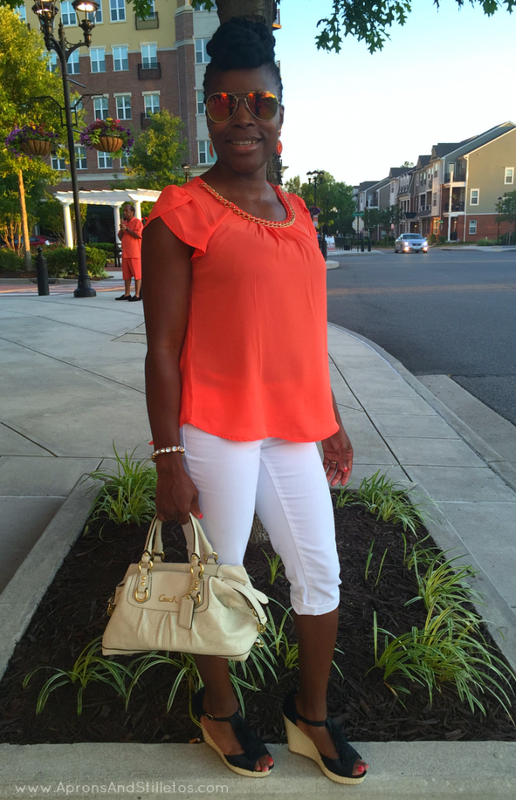 I love white jeans in the summer and plan to add more to my wardrobe. 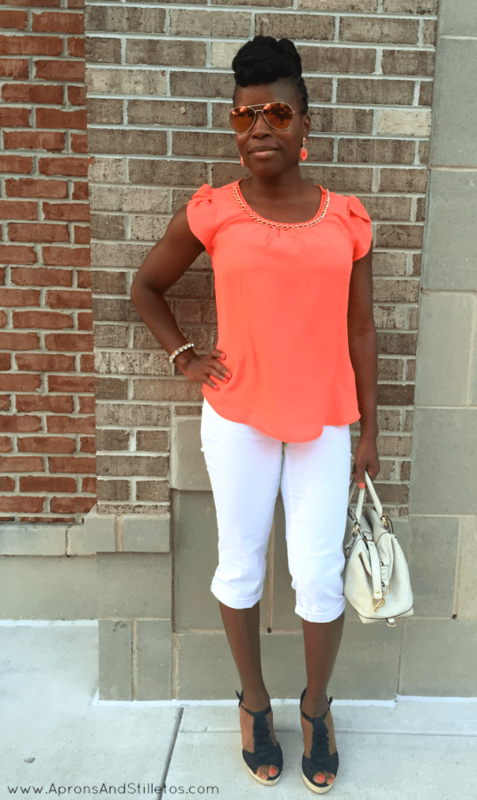 There’s just something crisp and clean about a white pant on a bright summer day. It says, “you ain’t worried bout no stains“. A women who wears them doesn’t concern herself with that. My sandals although heeled are very comfortable for minor walking. I was good for about 5-6 hours. 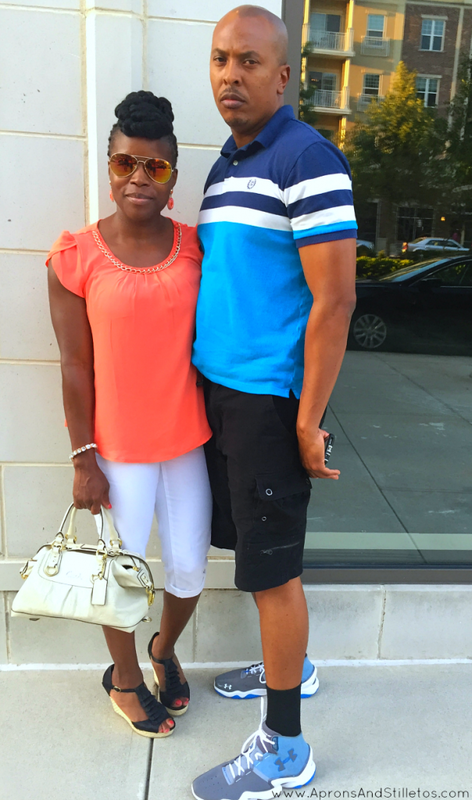 Although unplanned, my earrings and nail polish matched my shirt and I was feeling ultra fierce on this date with my husband. I have stayed consistent in my exercising and must say that I’m loving my arms. Them babies are toned to the max. I always look forward to wearing short sleeved shirts in the summer because of these arms. I think even they contribute to how fabulous I feel about this outfit. 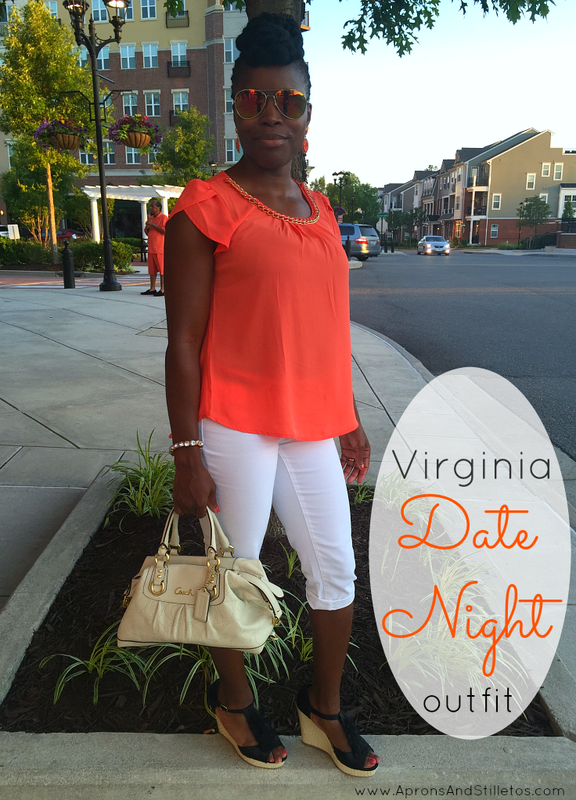 If you enjoyed this outfit, be sure to check out what I wore our second day in Virginia.